Painting with acrylics is a great way to express your creativity. It's such a versatile medium. If you have never tried it before, check out this page to get an idea of the acrylic painting supplies you will need to get started. Acrylic paints: Acrylic paints vary in thickness. There are two basic categories of acrylic paints: “heavy body” and “fluid” (aka “thin body” or “soft body”). Heavy body acrylic paints are thicker than fluid acrylic paints. They are great for a more sculptural look and mixed media works. But they can also be thinned down for traditional painting either with water or mediums. I use thick body acrylics simply because they are more like the consistency of oil paints. As for more thin bodied(or soft body) acrylic paints , many artists (including me) use them for large mural works. Also, if you want to try painting with acrylics in a watercolor-like style, soft body paints are a good choice. In addition to the thickness of acrylic paints, you should also consider their quality, sheen, pigmentation, and drying time. As with oils, there is a big difference between student-grade and artist-grade acrylic paints. It is worth it to buy artist-grade paints if you care about your artwork. Among their many drawbacks, cheap acrylic paints are not as lightfast as the top quality pigments. In most cases you can mix brands without a problem, but some brands don't seem to be compatible with others. You just have to experiment with them and find out. If you can, stick to a single brand for a while and then gradually add colors from different brands. As with oils, I recommend that you start with a limited palette of colors (say 6 or 7 plus white—or less). As you get familiar with that palette, you can gradually add to it. I do not endorse any particular brand of acrylic paints here--it is a highly personal choice. Just remember to buy artist grade! Acrylic brushes: Since acrylic paints are stiffer than water color, they require stiffer bristle brushes (like oil paints), but there is no need to buy a lot of brushes, as long as you maintain them well. I suggest that you start with a rigger brush (with a long thin pointed end), a couple of rounds , a couple of filberts (these are my favorites for doing portraits and landscapes), and several flats (I use them mainly for landscapes and still life). Again, get good quality brushes because it will make a difference in your work. Acrylic surfaces: Honestly, I don't know anything you can not paint acrylics on, except when the surface is greasy. You can use watercolor paper, cardboard, fabrics, wood panels, rocks, plastic, canvases, and acrylic pads. Each surface affects the way the paint is absorbed and the painting's appearance. Experiment with different surfaces to find one you like. Acrylic palette: Because acrylic dries quickly, it requires a palette that either will not be ruined when paint dries on it or that will keep the paints wet longer. If you dislike the idea of cleaning you palette and storing the wet paints immediately whenever you finish painting with acrylics, you should try using disposable acrylic palettes--they are a life saver. If you do want to save the paints, try a palette with an airtight lid that can keep acrylic paints wet for up to two weeks. Whatever you do with your leftover paints, remember not to freeze them like you would with oil paints. They will crack, and they don't thaw properly the way that frozen oil paints do. Acrylic painting knife: Do you like to use a painting knife instead of a brush? 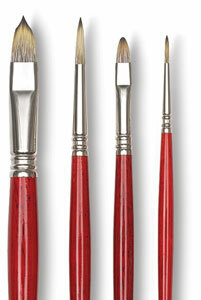 They are great tools for adding impasto paints (thick paints). Water jars: It is a good practice to have two water jars when painting with acrylics. Use one for cleaning the paints off the brushes, and the other for moistening fresh paint on the cleaned brush. This way you keep the colors and the brushes clean. Spray bottle: Keep a spray bottle near you to wet the paints, which prevents them from drying too fast. But don't spray too much, because it will eventually break down the film that needs to form for acrylic paints to dry properly. Alternatively, you can use palette wetting spray instead. The wetting spray contains a special resin that keeps the film intact while keeping the paint from drying too fast. Painting mediums: You can add even more versatility to painting with acrylics by mixing the colors with one or more of the various acrylic mediums. There are gloss and matte glazing mediums. There are also mediums that improve the flow and make paints more transparent. In addition, there are a vast number of texture gels which thicken paint for impasto effects or add wild variations of textures. Because the use of mediums will obviously make the process more complicated, I recommend that you master the basic techniques before using them. I use it mainly for transparent glazing. It is a good start for learning how to use mediums first. It will take some practice to learn to control it, however, because it is milky when wet and obscures the intensity of the colors first. Once it dries, it is completely transparent, and the color will show its true intensity again. There are a lot of other mediums to choose from. Stick with the one I suggested above first and go from there. Then feel free to explore and find what works for you.